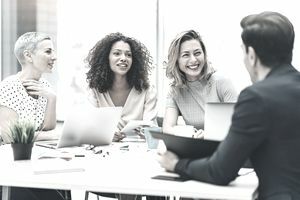 In any industry, a solid practice for attracting the most skilled employees comes down to leveraging employee benefits to strengthen the compensation package. Building an appealing comp plan that offers not only fair pay, but also a variety of benefits, can help any organization to beat out the competition. Comprehensive employee benefit packages often include generous paid time off from work, dental, vision, healthcare, short-term and long-term disability insurance, life insurance, retirement savings plans and flexible spending accounts. According to PayScale's 2017 Compensation Best Practices report, 44 percent of employers think they are doing a good job of paying their employees, but only 20 percent of employees feel the same. Many employers have plans to improve their compensation strategy, but it can be costly to do this for everyone. Creating an employee benefit program that includes multiple layers of affordable and flexible benefit options can offset these costs, while still appealing to talent. Here are some steps your organization can take to improve the structure and sustainability of your compensation plan and benefits for employees. Creating an attractive employee benefits package can take a lot of research on the part of the company, but it pays off in the end. The keys are to find out what benefits are available today and what employees need or want the most from their employer. In this article, you will learn how to put theory to work with actionable steps. The first thing you must do is learn the standards of the industry in which your company operates. This means that you should find out what your competitors are offering their employees in their benefits package. This can be accomplished by speaking with employees at your company who came to you from a competitor or by speaking with colleagues you know from other companies. Use data from several current salary surveys to investigate what related assignment rates and benefits look like in your market. Review your benefits offerings with a benefits agent knowledgeable about your field. It is also important that you seek feedback from your current employees. This can be done by sending out brief email surveys asking what they like most about the company’s benefits program and what is lacking. Another method is by using an internal employee engagement system that measures employee interest in benefits. Biometric information can also help you to see what benefits are being used and what's not getting much use. You should also talk to all of the employees who are leaving your company, whether for retirement or to work for someone else. This topic should be broached during the exit interview so you can gauge why they are leaving and if it is due to the benefits package you currently offer employees. Companies are becoming more inclined to work with a benefits consultant these days in order to put together an effective package. A benefits consultant will point you in the right direction, answer all of your questions, and even put together a package that meets the needs of your employees. Since they are considered an expert and they work with many of your competitors, they have an added layer of insight that you don’t have. Ask for at least two options in benefit packages that can be voted on by a committee of your employees. Private health insurance plans found in the marketplace must offer the same set of essential employee benefits to everyone at your company. These plans must cover emergency care, hospitalization, outpatient care, maternity and newborn care, mental health and substance abuse care, prescriptions, rehabilitation, lab services, pediatric care and wellness services. This may change somewhat as health care reform continues in the USA, so be sure to have some flexibility in plans being offered. Defined contributions and bonuses can be attractive for employees trying to afford healthcare insurance. The next step in strengthening your compensation packages for candidates is to communicate this package when discussing compensation at the time you extend a job offer. Have this in writing and provide information on your employee benefits website and printed brochures. The benefits package must be attractive to look at for the candidate, not just a piece of paper with words written on it. Instead, make sure the document has pictures, graphs, and tables in it to provide the candidate with a plethora of information about all the benefits offered by the company. Whenever your company posts a new job opening to a job board or to its careers page, be sure that the job description includes an overview of the benefits package available for that position. It does not have to be an in-depth description, but it should convey what will be available in a way that will appeal to your targeted talent. When you interview a candidate, make sure that the benefits package is part of the discussion. This will help the candidate know more about your company, the position and what you have to offer them. The benefits should be discussed in the first interview when your interviewer gives the candidate the overview of the company and the job available. You can actually get away with discussing the benefits package and not the salary at this time. If any of your employees are considering leaving the company for positions elsewhere, you need to communicate to them that the benefits they receive are second-to-none. According to Colonial Life, 73 percent of employees say that understanding the benefits they have is very important. In the same survey, 37 percent of employees want information on their benefits that they can understand. As a company, you need to communicate as effectively as possible about the available benefits. Whether this includes creating a newsletter or informational pamphlet or holding a seminar for employees; make sure your employees know what they have. In short, companies can attract some of the top talent in their industry by offering a strong compensation package that includes various forms of benefits. When you perform a review of your benefits and find that they need to be updated, make sure it is a quick process that encompasses your current and future employees.